Home Cinema André Rieu 2019 Maastricht Concert: Shall We Dance? André Rieu’s annual hometown Maastricht concerts attract fans from all corners of the globe. The medieval town square is transformed into a spectacular backdrop for unforgettable concerts filled with humour, fun and emotion for all ages – and, of course, magnificent music. 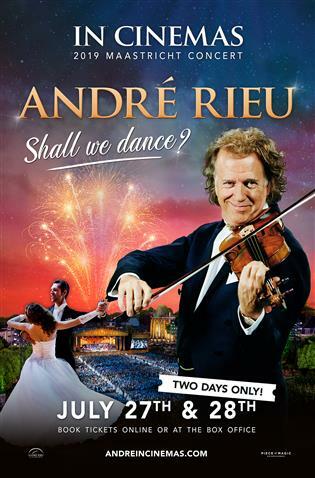 This year André Rieu invites you to put on your dancing shoes for his spectacular 2019 hometown concert from Maastricht: ‘Shall We Dance?’ You can waltz the night away with André Rieu – the majestic waltz has been such an inspiration to André throughout his career that its three-four beat has become, in many ways, the rhythm of his life. And this year the maestro will bring the waltz to life in an unforgettable evening of music and dance. Summer nights are made for dancing and this is a party you do not want to miss! Prepare to be swept off your feet by this magical celebration of dance on the big screen in the comfort of your local cinema. Join André Rieu, his Johann Strauss Orchestra, world class sopranos, The Platin Tenors and special guests for a magical cinema experience. Audiences will be treated to behind the scenes content and an exclusive interview with André and as always, some delicious surprises. Shall we dance?